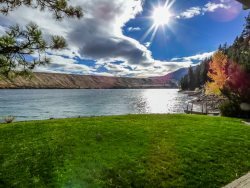 Wallowa Lake Lodging | King Sized Beds | Wallowa Lake Vacation Rentals. Large grassy yard for the kids to play in and a large deck for the parents to enjoy the view of Wallowa Lake from! These homes have atleast 1 king sized bed. Please refer to the individual cabin pages for exact sleeping descriptions. Knotty pine two story cabin with open floorplan, wood burning fireplace and king size bed! Knotty pine home with a beautiful view of Wallowa Lake! Large patio overlooking the Wallowa River makes this quite possibly the perfect place to spend your vacation! Private vacation home located on Wallowa Lake with a boat dock. Queen's Court #15 offers one of the best views of Wallowa Lake! Upper condo offers a tree line view of the resort side of Wallowa Lake! Tucked up next to a hill, near the end of the road, provides awesome privacy with a tree'd view of Wallowa Lake. Perfect home for your larger family with great outdoor space--even it's own pond! Private A Frame on the West side of Wallowa Lake with a private boat dock for your use! You won't wonder why it's called THE VIEW when you step in and stare at the Wallowa Mountains and Wallowa Lake! A modern day treehouse at Wallowa Lake while you stay at the Ram's Head. Wallowa Lake private home with your own boat dock! Gorgeous custom built home on the Wallowa River! Time Out on Wallowa Lake has a private boat dock and a gazebo for your enjoyment. Adorable Wallowa River frontage home straight out of Pinterest! Knotty pine charm and lots of cabin in the woods feelings but in a lovely modern cabin! Watch the fish spawn from the dining room window--it's THAT close to the Wallowa River! Enjoy your time spent on the dock or in the hot tub while overlooking Wallowa Lake.